from government, business, and consumers. Painters Institute and has earned the Green Seal stamp of approval. 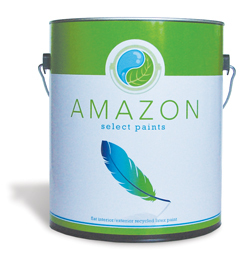 Amazon Select® meets or exceeds the performance specifications of national paint brands. easily and provides excellent coverage. Most jobs require just one coat of Amazon Select. be confident that our paint is every bit as good as the more expensive, ‘virgin’ paint sold in the big box stores. saves energy, reduces pollution, and reduces landfill waste. efficiency to use of recycled content materials to handling of waste materials. amount of VOCs in paint to 250 grams per liter. considered ‘low VOC” by Green Seal. applications and for interior use when there is good ventilation and no other air quality concerns. VOC paint. This is because over 90% of the material used in Amazon’s paint has already been made into paint. making gallon of Amazon’s recycled content paint.